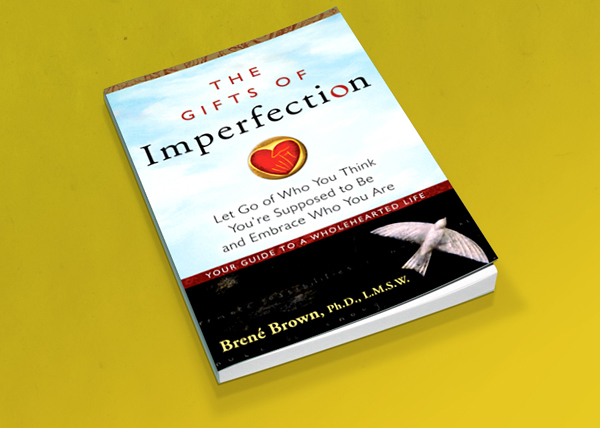 I recently finished a book by Brené Brown titled The Gifts of Imperfection and I wanted to relate her work on wholehearted living to what I write about on this blog; namely well-being. I found the book intriguing as we reach many of the same conclusions but approach the topic from different angles. Brené uses a qualitative research approach to discover strategies that lead to wholehearted living or what I call well-being. Qualitative research is a scientific methodology frequently employed in the social sciences with the aim of determining the how and why of human behavior. In layman’s terms Brené tries to have no preconceived notions about the topic she is researching and lets the data drive the theory. As we all have a tendency to validate our existing beliefs, it is encouraging for me to learn that we reached similar conclusions in light of the fact that Brené was not specifically looking for those conclusions. We agree that there is a certain set of behaviors or strategies that lead to well-being and that love and belonging are irreducible human needs. However in addition, I believe it is helpful to explicitly link the how (strategies) to an expanded list of why (needs). Focusing too intently on how to the relative relegation of why and underestimating their connection can lead to the belief that by simply eliminating ineffective strategies we will automatically achieve well-being when in fact, achieving well-being is a process of replacing ineffective strategies with effective strategies. The Gifts of Imperfection deals with the human behaviors that constitute and support living life in a wholehearted fashion. Brené is a research professor and while studying the dynamics of human connection she stumbled onto the topic of wholehearted living by discovering repetitive themes in interviews with thousands of people involved in her research studies. She found common values and strategies in a group of people that seemed to possess high levels of life satisfaction. She identified the group as people who were living “wholeheartedly.” In the book she details what those wholehearted strategies and values are and identifies some of the roadblocks that interfere with wholehearted living. I highly recommend her book, and taking nothing away from it, I would like to discuss two areas where we have slightly different views. First, she focuses on specific strategies as the way to wholehearted living, I focus on needs. The strategies she discovered that leads to wholehearted living are strategies that I would describe as needs-meeting. I perceive that Brené and I look at achieving well-being from slightly different, yet complimentary perspectives. Her focus on strategies is focusing on how people achieve well-being. And to cull out, through qualitative research, the effective strategies from the multitude of strategies (both effective and ineffective) that people employ is time and resource intensive. Most of us don’t have those resources at our disposal so I’m grateful Brené was courageous enough to share her work. I, on the other hand, focus on why. Focusing on why people employ strategies is to focus on needs. There are a relatively small number of irreducible human needs and to focus on what will satisfy those needs greatly reduces the viable strategies that one can employ and helps to clarify why some strategies are more effective than others. This in turn makes it easier to narrow down the field and focus on the strategies with the greatest potential to increase our well-being. Also, the ramifications of the choices we make become more evident in light of the fact that we have multiple needs vying for or attention simultaneously. Suppose I try to meet my needs for connection by hanging out at a bar and getting drunk. I may get my need for connection met as I engage with other drinkers, but at the same time my need for self-esteem and safety aren’t being met. Once I get home (hopefully safely! ), instead of feeling joy over my sense of belonging I may feel uncomfortable or even remorseful about my actions and my esteem needs will suffer. So rather than getting drunk at a bar, I find that creating relationships where my unique attributes are cherished is more likely to lead to greater well-being as I do not compromise my other needs in this process. At one point in the book Brené does address needs. She explicitly states that love and belonging are irreducible human needs and I couldn’t agree more. Yet again, those aren’t our only needs. A scientific evaluation of the strategies that increase human well-being is necessary and to incorporate into the evaluation which needs the strategies are trying to satisfy would greatly enhance our knowledge in this area. Our second point of difference revolves around Brené’s statement that her book is not a “how-to” book, because we already know “how-to.” Brené believes that all we need to do is to overcome the barriers that impede us from wholehearted living in order to implement the strategies that foster well-being. While I believe that we are inherently predisposed to adopt strategies that will help us meet our needs, we still must learn those strategies. Like language, we can pick it up quickly, but it must be demonstrated. Martin Seligman, a clinical psychologist and the father of positive psychology, has a poignant anecdote in his book Flourish about the importance of replacing ineffective strategies with ones that are effective. He tells of “curing” patients of their issues only to find them empty instead of happy. This emptiness often led to a later relapse and goes a long way in explaining the dismal success rates of traditional therapy. Well-being for those of us who did not learn effective strategies as children is a two-phase process. Out with the old and in with the new. I stress this point because of the prevalence in the belief that if people can only “solve their problems” then they will be “fixed.” Unlearning the ineffective strategies (getting rid of the barriers) is only half the battle. The needs we are trying to meet with less effective strategies don’t just go away. We can’t achieve a placid state of nirvana where there is a cessation of all desire. (I wouldn’t even want that if it were possible.) Needs are omnipresent and demand attention. If we don’t replace the ineffective strategies with effective strategies we will eventually revert back to the old strategies or find new strategies that are potentially, equally ineffective. The bottom line is that no matter how we approach it or what we call it, we discover that some people have more of it than others. Those who have well-being, as I would call it, are those individuals who use effective strategies to meet their objective human needs consistently. If we want to be more like these folks we must do two things. First, we must get rid of the ineffective strategies that we believe are helping us meet our needs, but are in fact impeding us. Unfortunately these are often long standing strategies born from a childhood environment in which our needs where not fully met. And it takes a great deal of introspection and sometimes painful honesty to gain the self- knowledge necessary to put into realistic perspective how our past effects our present. Second, in conjunction with eliminating old ineffective strategies we must implement new strategies which are effective at meeting our needs. The traditional model of mental health therapy has been to remove ineffective strategies. From Freud’s neurosis to the plethora of mental disorders described in the DSM V there is no shortage of diagnosis of ineffective strategies. There has been much time and effort devoted to “fixing” people and not enough time devoted to finding effective strategies to meet objective and irreducible human needs. Increasing our well-being is arguably the main goal of our lives and a scientific approach to this topic is well warranted. I applaud the research Brené is involved in as a step in the right direction to a scientifically based evaluation of the question of well-being and the strategies that enhance it. I think it would also be of great benefit to incorporate a model of needs and subject it to scientific scrutiny in order to more quickly obtain actionable results and ultimately enhance human well-being. This entry was posted in Philosophy and tagged brene brown, DSM-5, Flourish: A Visionary New Understanding of Happiness and Well-being, Freud, happiness, human nature, human survival, human well-being, Martin E. P. Seligman, optimal well-being, personal freedom, philosophy and ethics, Teaching Empathy, The Gifts of Imperfection by Scott Byars. Bookmark the permalink.